For various good reasons, work on the layout has been slow recently. 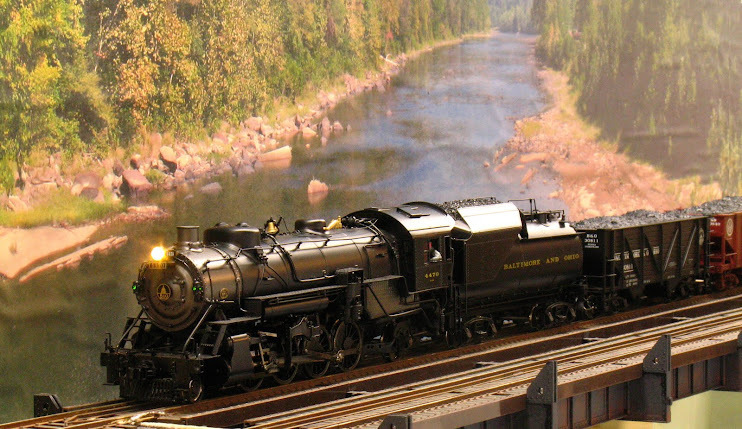 However, I did attend the 2012 O Scale National Convention in Parsippany, NJ. The convention was fairly conventional (pun intended), so let me tell you about a particular piece of swag that I came home with. For anyone who has been to more than a couple of train shows or conventions knows that being there when the doors to the dealer hall open is critical. All of the really good deals are snapped up in the first hour or less. So it was with this show. 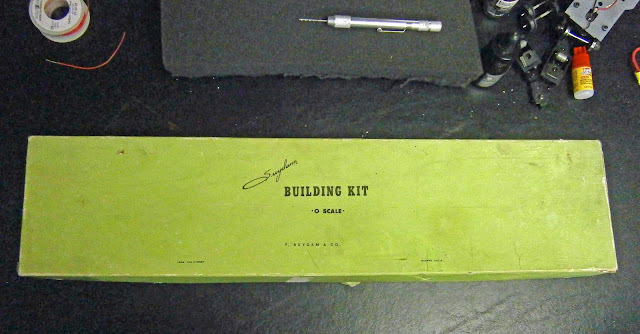 On about my third aisle, I spotted a Suydam O Scale building kit for a furniture factory. I knew that at one time Suydam made HO scale kits, but if I ever knew anything about what their HO kits were like I have long since forgotten. I do not remember ever hearing of an O Scale Suydam kit. The obviously ancient kit box was sealed with tape and was satisfyingly heavy. I was not about to be crass enough to open it for inspection, especially since it was priced at only $15. I figured that for $15 I could afford to buy a "pig in a poke"; so I bought the kit. About 10 minutes later, another attendee stopped me to ask how did I like soldering those Suydam kits? Solder? Solder? I thought. Did I hear that right? Was this guy suggesting that I was going to have to solder a structure kit? I figured that it was better to feign inexperience than ignorance and I responded, entirely truthfully, but evasively, "I don't know, this is the first one that I will be building." Eventually, I took the box out to my car rather than schlep it through all of the clinic rooms. I opened the box and the photos show what I beheld. 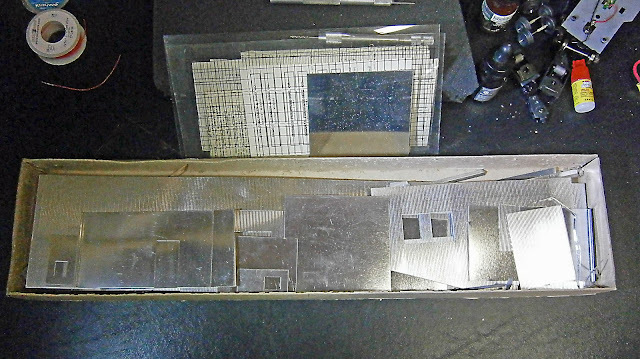 The box was filled with neatly die-cut and formed pieces of flat and corrugated tin-plated steel. A few turned wood detail parts (that actually appear to be HO size) and a few sheets of instructions - for the HO kit. A single sheet appendix for the O scale kit acknowledges that the instructions are for the HO kit, but O scalers should be smart enough to figure out what the differences are for themselves (well, maybe). And, yes, the instructions for the HO kit specify soldering for assembly. I've done some quick research on these kits. I can find little about the O scale kits; but HO builders recommend Walther's Goo for assembly. I think that I will stick with solder. I don't think that I will build this as a furniture or other woodworking facility, but I'll incorporate it into the Alpha Portland Cement complex as a warehouse. Other swag that I came away with were wheelsets and trucks - items that the local hobby shop does not carry in "O". Two things really made the convention for me. I did interviews with some of the clinic presenters for the Model Rail Radio podcast; and a half-hour interview with Tony Koester. I'm hoping that Tom Barbalet, the head honcho at Model Rail Radio, will collect all of the interviews into a show dedicated to the O Scale National and O scale. I'm hoping that a dedicated show will get some O scale guys into listening to podcasts. Right now, when I mention a podcast to a O scaler, I may as well be speaking Klingon. The second thing was that I got to do a clinic at the convention, albeit it was an impromptu thing. As far back as January, I had offered to do a clinic on photo backdrops at the national, but they had a full clinic schedule. However, their best laid plans went awry and several clinicians did not show up. I volunteered again and this time I was accepted. That gave me a couple of nights to pull together a presentation - and I had brought no materials with me. I pulled my photo backdrop videos down from the web and cut some slides out of the videos. I filled out that material with new slides and I was ready; although without the polished presentation that I would like to have made. My time slot was 10 am on Sunday morning. Now the convention was winding down on Saturday afternoon with several vendors pulling out. I did not know how many attendees would be here Sunday morning, so I made up only 5 CDs with my presentation and videos on them as handouts. As luck would have it, 15+ people showed up for the clinic. I made a sign-up sheet and will mail discs to the people who did not receive them. The presentation was well-received with some people remarking that it was the best of the week. One of the "getaway" layouts on my way home was in Bethlehem, PA; and in design and execution it is the most unusual layout that I have ever seen. Out behind his modest home this gentleman had built a 4500 sq. ft. basement and put a roof over it - but there was no house involved. The basement walls were capped with roof trusses to provide a clear span and there was no house between. With 4500 square feet, even in O scale, one would expect a railroad representing a line from the Atlantic or the Pacific to the Mississippi. Not for this modeler. Most of the square footage of the layout was a single scene of Easton, Pennsylvania where the Lehigh and Delaware rivers converge and five rail lines, primarily Jersey Central and Lehigh Valley, but with appearances by the Pennsylvania, Lackawanna and the Lehigh and Hudson River, come together. The following photo shows the area of the layout near the river junction. This a panorama made up of 5 exposures. Click on the photo for a bigger view to appreciate it. I estimate that the river scene is compressed by only a factor of three or four and I'd be surprised if it were more than a factor of five or six. In this layout, the trains are definitely are dwarfed by the scenery. The bridge in the center of this picture is for the Lehigh and Hudson River Railroad (yes, it really is curved). In the right foreground is a small portion of the Jersey Central bridge over the Delaware, which seems to be close to 50 actual feet long. The aisle runs along the bridge (you are walking in the river) and on the other side of the aisle is an equally long and impressive Lehigh Valley Bridge. The Morris and Delaware canals are also represented including their inclined planes. But the most unique thing about this layout is that, as far as I can tell, there is no facility for continuous running of the trains. Each railroad follows it's route along or across the rivers and dead-ends at a wall. The one exception might be the combined Jersey Central/Lackawanna which had a sizable yard and might have held a continuous running connection. All in all, even my wife was impressed.